Clyde Butcher's photographs explore his personal relationship with the environment. 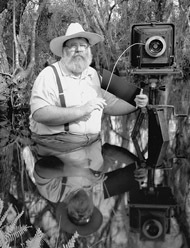 For more than 40 years, he has been preserving on black and white film the untouched areas of the landscape. His images are captured with an 8"x 10" and 11"x 14" view camera and are printed in limited editions on fiber base paper, and then selenium toned for archival purposes. The photographic prints range in sizes 11x 14 inches to 5x 8 feet. Clyde also scans his black and white negatives then works on them in PhotoShop creating open edition prints. Clyde has been honored by the state of Florida with the highest award that can be given a private citizen: the Artist Hall of Fame Award. He was also privileged to receive the Lifetime Achievement Award from the North American Nature Photography Association and given the honor of being the Humanitarian of the Year for 2005 from International University. He has also received the Heartland Community Service Award from the state of Florida for educating the people of Florida about the beauty of their state. The Sierra Club has given him the Ansel Adams Conservation Award, which is given to a photographer who shows excellence in photography and has contributed to the public awareness of the environment.